The Washington University School of Medicine in St. Louis has done everyone a favor. It has a table that displays all of the undergraduate institutions of students who have attended the school. Don’t get it? US News and World Report ranks Washington University as one of the top medical schools in the country. And you may have heard, they rank undergraduate institutions as well. By listing all the undergraduate institutions of its students for the past 15 years, the table offers a perfect opportunity to look at the significance of rankings. And what conclusions might we draw after viewing the table? For all those pre-med wannabes who believe that you have a better shot at med school if you attend its undergraduate institution-here’s a little validation for you. The largest number of students, 207, came from Washington University. Of course, you have no way of knowing how many actually applied and didn’t get admitted but no worries, enjoy the numbers for now. In the got to attend the most prestigious school possible camp? Good news for you too. 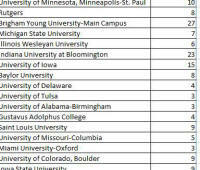 Among the next 20 schools, only three are not ranked in the top 25 by US News. In fact, 14 are ranked in the top 20. So hopefully those facts will keep you motivated as you take your 10th AP exam or raise the next $10,000 for charity. So does that mean US News and World Report College Rankings wins? Because a fifth of their students came from colleges that weren’t in the top 50. That means you are NOT doomed to a life of mediocrity because you didn’t go to a top 50 institution. In fact, of the 116 colleges and universities listed, 36 are 50-50 schools and account for just under 20 percent of the students admitted. During this time period, ten students from the University of Illinois Chicago, ranked near 150th, enrolled in the Medical School which is just one less than the number of students that enrolled from the University of North Carolina at Chapel Hill, ranked 29th. Gustavus Adolphus sent a total of four students during this time period, a small enough number for many to write off as just a statistical blip. However, given its size compared to the highest ranked school, Harvard (it just doesn’t seem fair to use Washington University), that would be the equivalent of 32 students to 88. Harvard still wins. But you would expect Harvard to win because they have the pick of some of the most amazing students in the nation. The point is that students good enough for Washington U’s med school don’t just come from the “elite” colleges. Or should I say “universities” since there is also a perception that to really prepare for med school, you need to attend a university for research opportunities. Seven of the top 20 US News schools on the list are Liberal Arts Colleges (LACs). On a per capita basis, Williams and Amherst send more students to Washington U Med School than Harvard. Of course, they are the top ranked LACs in the nation but Harvard is tops in its category as well. And I don’t think it’s because all the other Harvard grads went to better medical schools. Now I know that this in no way can be considered a scientific or definitive analysis of college rankings. There are all sort of “extenuating” factors. Students from the University of Illinois-Chicago are closer geographically, perhaps allowing the admissions office to be more familiar with their recommendations. For all I know, the four students from Gustavus were all from one year, a fluke never to be repeated. Furthermore, Washington University School of Medicine, unlike other institutions that list only the average, provides the ranges for GPAs and MCAT scores of its First Year Class. And at least one person had a GPA of only 3.4. The lowest MCAT score was 28. Maybe it was the same person and who has an aunt who donated a new laboratory building to the school. Who knows? It does at least offer the possibility of being evaluated by more than just your test scores. So what does this say about college rankings? They aren’t the definitive measure of student success. Lots of good high school students go to Harvard so you would expect a large number to go to medical schools of similar reputation. However, there are obviously good students who don’t go to Harvard and end up in the same place. While I wouldn’t expect this to the change the minds of those who think the only valuable education is available at “elite” institutions, I do think it should give some confidence to those who choose to pursue their college careers at institutions outside the US News and World Report College Rankings limelight.